Mr. Arthur Martin “Art” Matthews, Jr., 75, loving husband of Linda Winfield Matthews and a resident of Onancock, VA, formerly of Virginia Beach, VA, passed away Thursday, January 17, 2019 at Riverside Shore Memorial Hospital. Born June 6, 1943 in Norfolk, VA, he was the only child of Arthur Martin Matthews, Sr. and Jesse Stanford Matthews. Following high school, Art enrolled at Old Dominion University, however, he became more focused on winning Bridge games than his studies. He quickly learned excelling in card games would not secure his future so he left college and enlisted in the United States Air Force. Art, who was known for accomplishing anything he set his mind to, returned to ODU after four years in the USAF. With his sheer determination, and perhaps a little military discipline, Art completed his degree. The training and expertise he gained during his time in the service allowed him to continue serving his country working as an electronic technician for the U.S. Civil Service at Norfolk Naval Air Station, retiring in 2000, after more than 37 years of dedicated service. Raised in Catholic homes, Art and Linda’s love story began when they met while attending Mass at St. Pius X Catholic Church, in Norfolk, where they remained members until moving to the Eastern Shore of Virginia in 2001. Since moving to the Shore, they have been devoted members of Saint Peter the Apostle Catholic Church, in Onley, VA. Art was very passionate in his volunteer work, for his church, and for his community. 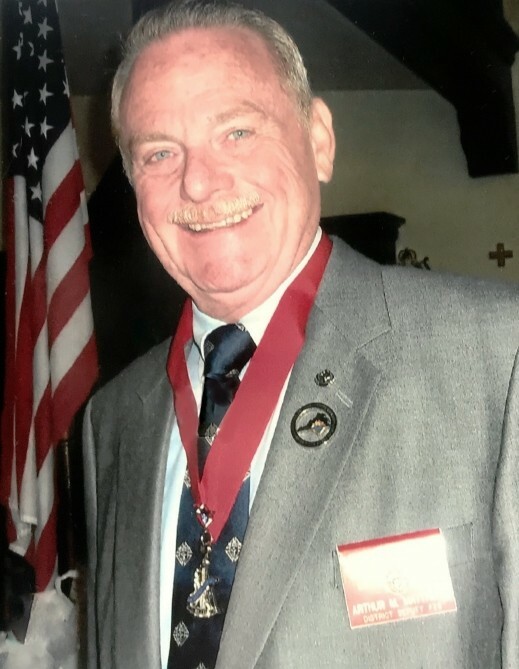 In addition to a lifetime of serving the Lord, Art was very active in the Knights of Columbus, Habitat for Humanity, and countless organizations and community projects. Art will be remembered for his welcoming smile, his quick wit and sense of humor, his unwavering compassion and commitment to help those in need, and last but not least, his unparalleled Bridge skills. In addition to his wife of nearly fifty years, he is survived by their two sons, Craig Matthews and wife Susan of Grifton, NC, and Brett Matthews and wife Heather of Rocky Mount, VA; grandsons, Owen, Lane, and Nate; cousins, Bill Thompson and wife Sandy, and Elizabeth Benka and husband Danny; and numerous nieces and nephews. A Memorial Mass to celebrate Art’s life will be held at St. Peter the Apostle Catholic Church, in Onley, on Tuesday, January 22, 2019 at 11:00 a.m., with Father Michael Imperial officiating. The family will greet friends at the church one hour prior to the service. In lieu of flowers, memorial contributions may be made to St. Peter the Apostle Catholic Church Construction Fund, P.O. Box 860, Onley, VA 23418 or to the Knights of Columbus, c/o St. Peter's, P.O. Box 860, Onley, VA 23418.